Beef Enchiladas, Thyme for Cooking main course. Put 1/3 cup of enchilada or taco sauce into a baking dish large enough to hold 4 enchiladas. 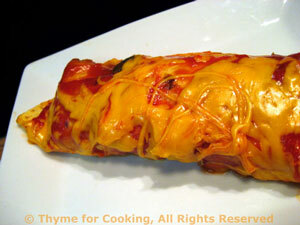 Pour the rest of the Enchilada/Taco sauce over the finished enchiladas, sprinkle with the remaining 1/2 cup cheese.